The Man Bird and I are suckers for an Afternoon Tea, so when my beady eye spotted an offer for Afternoon Tea for two for a tenner, I quickly got us a table booked. 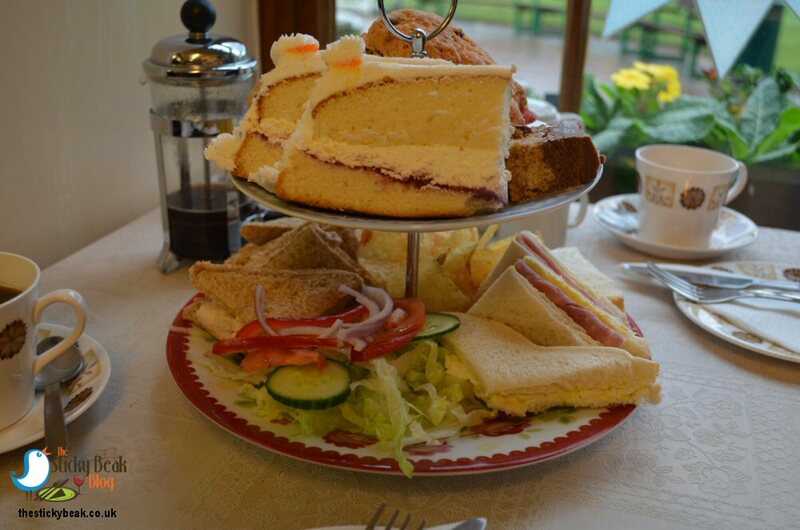 I’ve had Afternoon Tea at Alfreton House Tea Rooms before, although not for a long while. It’s normally only £12 for two people anyway, but a tenner seems a much nicer, round number doesn’t it - especially in the long pay month of January! 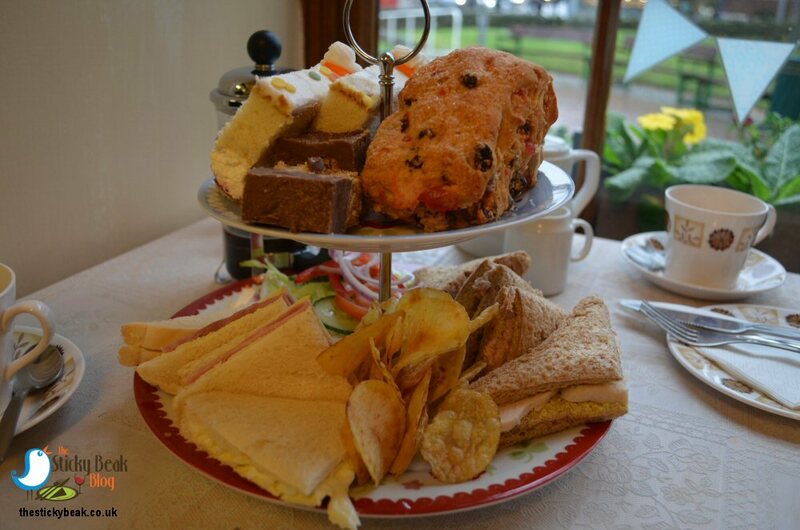 What I really like about the Afternoon Tea at Alfreton House Tea Rooms is the fact that you are given a choice of any two sandwich fillings from Tuna Mayo, Egg Mayo (without Cress), Cheese, Ham, or Chicken. You can also choose White or Brown bread. The other fab thing is that all the salad is separate on the plate; perfect for those who have a split camp like us - I love salad, His Nibs will dodge it where possible! As well as the sandwiches and salad there is also a large portion of plain crisps to nibble at. The sandwiches themselves had plenty of filling in them; enough to be generous, but not overly crammed so that their contents oozed out onto the plate, or dropped onto clothes. It’s the sweet treats that really make your eyes pop out on stalks though. I couldn’t get over the depth of the Victoria sponge; it must’ve been at least 5” deep! In the middle there was fresh cream and strawberry jam, and the top had a lovely Vanilla soft icing on it; very yummy. There were slices of gooey Cadbury Creme Egg tray bake to nibble at, and we both loved the contrast between the crumbly bottom and the rich chocolatey top. The size of the Cherry and fruit scones was amazing; they were probably about double the size of normal scones. 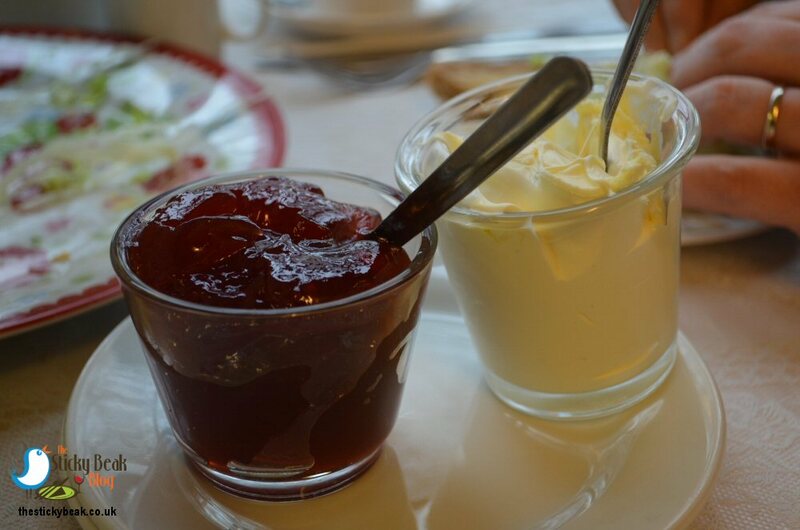 Two separate pots of Clotted Cream and fruit jam were placed on the table as well, so you can add as much or as little of these as you want – or even just have jam or cream if there’s one you don’t like. 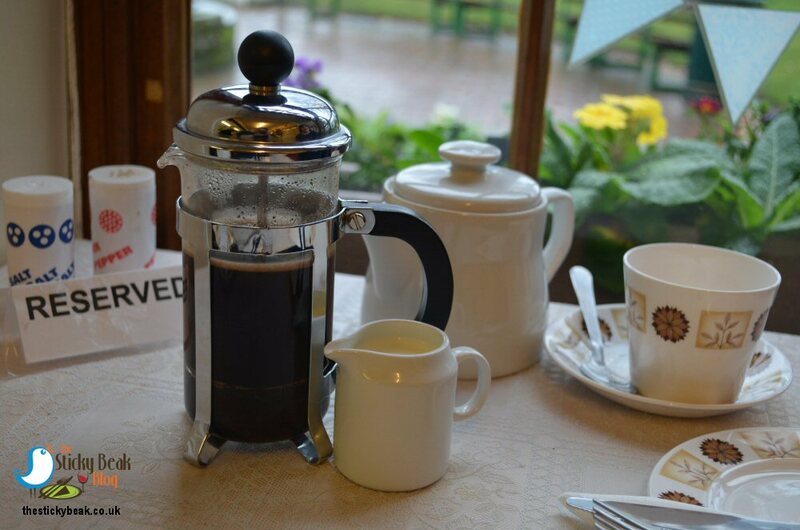 Included in the price of the afternoon tea is a Cafetiere of coffee or pot of tea, we had one of each. My pot of tea held enough for three cups, which was more than enough for me! His Nibs ordered an additional Cafetiere of coffee, which I think cost about £1.50 - very good value! We went at peak time, so the team were very busy, and there was a minor error (not with our order, but another table got a cappuccino instead of coffee with milk),but the staff were so very friendly and polite, and quickly rectified it. They do cater for gluten free and vegan requirements, but require at least 24 hours notice. Having said that, most of the meals on the normal day-to-day menu are/can be gluten free anyway. Look out for an exciting new version of Afternoon Tea coming in February Half-Term – I can’t say anything else about it, my lips are (uncharacteristically) sealed; but it’s fab, trust me! Hot Wings for this quirky little Tea Room - it’s not posh, but it’s friendly, clean, and the food is very tasty - and that’s what counts in my book!